We jus t recently found out that there is a way you can recover your files from the CryptoLocker Virus. FireEye and Fox-IT have somehow managed to gain access to the private encryption keys used by the CryptoLocker’s programmers. They were also able to reverse-engineer the virus code and create a website that will allow you to recover your files from this devastating virus. All you need to do to repair the CryptoLocker virus is go to , Enter your email address, and upload one of your infected files and then you will be presented with the decryption key necessary to unlock the rest of your files. One small downfall is that if you have been infected by a variant of the CryptoLocker virus this fix may not work. Variants start out as the same virus and then are modified to meet the wants and needs of that particular programmer. 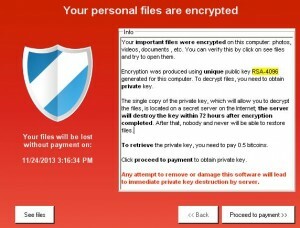 How do you get the CryptoLocker virus? The virus is can be received in many ways, but the ones we have worked on are coming through as email attachments. For example: “UPS Shipment”, “Paypal”, “Tax Updates”, or any ZIP file extension. This may come from someone you know if they have been infected with malware or another virus. What does the CryptoLocker affect? The virus adds cryptography to all of the word documents, excel, pictures, mp3, text documents and .ini files. The CryptoLocker virus will even seek out files on your network drives. One thing we have come across is that the virus will only affect what you have access to. If you are denied access to a drive on the network it will not be able to reach any files on that drive. You will know that the file in infected because it will give you a pop-up that says this file has been protected or locked. The pop-up will usually be a red screen that will say “Your personal files are encrypted” and show you a countdown clock. The countdown clock shows when your price to buy the key goes up. So if you do not purchase the $300’s in Bitcoin’s or Moneypak to fix the virus $300 will go up. The virus infects the files by making a copy of the file, injecting the cryptography and then deleting the original file. By the time you figure out that you have the virus, it is too late. If you are lucky enough to find the originating computer before it spreads to your network, you can save yourself a ton of work. Since this procedure works in the background it is totally undetectable until someone opens up an infected file. How to figure out who has a virus on the network? So far this has been pretty easy for us to tell who the culprit has been. In all of our cases we could deduce the person who had the virus because their personal drive on the network had the viruses. When we setup a network our default settings we assign a user drive that syncs with their “My Documents” directory. By doing folder syncing the files are always safe on the server if the laptop were to get stolen or broken, plus their files are backed up via the backup utility. (One caveat: This can be a pain in the rump with the new MS Outlook because it stores the PST in the My Documents folder, which you will have to relocate back to the old directory in the “users” directory.) One could also deduce the person with the virus by figuring out the access rights to the drives that were infected. Before the fix was available, you had three options. 1. Pay the Money, 2. Restore your files from an earlier date, 3. Lose your data and cry. We have worked on this virus for other companies and we ended up restoring the data piece by piece, which took 11 hours but it was less time than just doing a full restore. Be glad that some one put forth the effort to remedy this virus, for free. If you are having trouble with Viruses, Computer Issues or Network Administration, let us know. Hackers have setup websites that installs malware when you visit them. You will get an email or ads that will entice you to go to these sites. If you are using Internet Explorer be mindful of the website links you click on either in an email or on the web. The Hack exploits a bug in Internet Explorer and allows the attacker to take over your computer and do what they want. This particular Hack/bug affects the every version of Internet Explorer. This particular Hack relies on Internet Explorer’s add-ons. Microsoft recommends running IE in “Enhanced Protect Mode” and disabling your third party add-ons. To really fix the issue, use a different browser while the patch is being rolled out. Microsoft is currently working on a patch for Internet Explorer and will release the update as soon as they are finished. The really bad news is that if you are running Microsoft XP, you will NOT be receiving an update to fix this. Microsoft needs to move fast on this issue because it may have a snowball effect. If you are having any issues with your Computer and you feel that this may be the issue, please contact us right away. We have many clients come in and ask what YouTube entails and what they can do to apply their business to YouTube. In most cases, you’re only limited by your creativity and the amount of time you have on your hands. Good video quality and production are important. Think about if you were only able to watch Breaking Bad in shaky cell phone quality instead of enjoying the crisp visuals on your HD television. The quality of your output is a reflection on your company. If you put out a high-quality video, then part of your battle is already won. The other important element is having a goal in mind before the video is created, much less available to the public. Are you shooting to sell products? Engage existing customers on a new platform? These are the questions that need asking before a video is shot. Communication with the client is important to establish these goals and ensure traffic from the video on the web site accomplishes these goals. Once the goals are established, it’s important to treat the video as if it were a page on the web site. When it’s uploaded, does it have an appropriate and descriptive title, tags, and detailed description? These are crucial elements to moving yourself ahead of potential competition and getting you noticed in the sea of videos uploaded every day to YouTube. Consider using Photoshop or another image program to craft an eye-catching thumbnail. It’s the first thing those potential customers on YouTube will see when they discover your video, and you only get one chance to leave a first impression. Make sure it’s the right one. Finally, if your goal is indeed to drive traffic to your web site, make sure you have an annotation as well as a link in the description of your video linking to the appropriate site. YouTube is the second-largest search engine behind Google. Make sure you’re utilizing it in the best way possible, and you may be surprised at the results! Google rolls out it’s updated Play Services with features such as Google+ integration for customizing user expreience, in-app purchases, multi-player gaming, and more. Big news for the Android world it would seem, but I must say that I am not impressed. They are all definitely “must-have’s” for the Android world, but these are all things that Apple has done for years. I’ve used both Apple and Android devices for years. There are things about both types of devices that I like and do not like. However, I must say I’m surprised to see all of the hype surrounding Google’s latest Play Services update. Am I misinterpreting all of the fuss being made? Is it not hype but more of a, “It’s about time!”? It’s hard to tell. One thing about the new update that I do like is that you will be able to access your Google Docs from any app that takes advantage of the new Google Drive API, update your docs, work offline on them, and have them automatically sync with your online files once an internet conenction is made again. I don’t personally use Google Docs just because I have no need for it, but I can definitely see where this would be a huge bonus for those users who do. All-in-all, any Google app developer will be happy about the update in general, and the update appears to have lots of updated features to improve upon current apps or allow you to make that app you’ve been wanting to make but just didn’t have the functionality to do so. So head on over to developer.android.com and check out all of the services available to you. Our client needed to update their web presence to help supplement advertising and sales at their physical location. Their existing website was based on older technologies and a table-based layout. The site desperately needed to highlight the products being offered and have a more clear visual hierarchy. This would allow customers to be directed to the products more quickly and have a better user experience overall. With the use of color & css/html, we were able to give the site a full make over, removing the old table-based layout and updating the user interface to allow for ease of navigation. We also gave “The Best of Both Worlds” some instruction on how to better photograph their product line so users get a better representation of what they are buying. We reorganized the data structure of the site using the proper html tags to allow for better SEO and site indexing. We were able to maintain key parts of their shopping cart software, and used a bit of PHP magic to update some of database queries and search features to improve the site speed as well as keeping the cost of the project lower. The new, much more vibrant color palette and site branding really helped to showcase our client’s overall passion for their products and better represent their sales niche. Theatre costumes and props should NOT be boring. The improved menu systems and user interface allowed the customers to find what they were looking for quicker and easier. This led to a lot of customer compliments when the site was launched. The content management system we provided allowed our client to dynamically change all the products and spotlights on the index page, “The Best of Both Worlds” was able to specifically target upcoming plays and events in the area. This, coupled with their better product shots led to an increase in overall sales for the site. Keeping consistent margins in your layout, copy and basic design is one of the easiest things you can do to produce a cleaner site. This comes as no surprise to someone who has been designing sites or using a grid based layout system for years but a lot of times someone new to the profession may overlook this basic design strategy. Using consistent margins can help your site design in simple yet effective ways. It typically creates a design that is visually clean. Consistent margins add a layer of unification to your entire layout. The readability of copy is improved when the content is divided into well-spaced columns. Clean margins can help the visual flow of your website from top-left to bottom-right. Once defined, you can cause visual impact by breaking your own margin rules to highlight important ideas or imagery. Cramped designs can benefit greatly by using margins to “air” the site out, adding negative space to the overall layout and relieving the visual tension cause by elements sitting to close to one another or having uneven borders. By doing this you can created order from chaos and have a much better looking final product. Next iPhone Coming in September? Apple is rumored to be unveiling its next release of the iPhone this coming September. This launch would come at a vital time for Apple, which is still making a profit on the iPhone, but has seen its market share fall due to increased competition from the lower-priced Android devices. Many analysts expects Apple to adopt a new tactic to cover the mid-range smartphone consumer. Generally speaking Apple has offered their 1 year old and 2 year old models for 100 and 200 dollars off their latest model respectively. However, some murmurings suggest that the company may also release a new and lower-cost model of the iPhone along with the update to the current iPhone 5. As of now there is no confirmation of new features that wil be available for the next iPhone. Most likely the new model will have basic camera and processor improvements. Some rumors have also been hinting at a fingerprint sensor ever since Apple purchased the company Authentec last year. The new model will be running iOS7, which has been in beta testing since June. The iOS7 software includes a new design, better organization, and a total rehaul of the iPhone’s menus. Google’s Android operating system is continuing its path to market dominance which is beginning to pose problems for competitors Apple and Blackberry. New information from IDC indicates that Apple’s share of the global market has fallen to 13.2% in the second quarter. This figure is down from 16.6% from this this same period last year. IDC data also shows that handsets running the Android OS has jumped to 79.3% from 69.1%. These numbers are very bad for ex-market leader, BlackBerry. Despite the release of several new devices and announcements, BlackBerry only holds 2.9% of the global market share. Google’s latest strategy is to give the Android OS away for free to device makers and make up the money on associated advertising of these devices. Android is currently being run on industry giant Samsung, and recent deals with Lenovo, ZTE, and Huawei to run the Android OS has helped Google to grab a larger chunk of the market. Google’s strategy of partnering with other mobile companies is really paying off for them. Apple keeps the iOS on devices solely made by them. If Apple wishes to remain competitive, they may need to change strategies.